The Iron Age fort on Wittenham Clumps dominates a landscape settled since remotest antiquity. To the south, in the Berkshire Downs, is Churn Nob, and here, in 635AD the missionary Bishop Birinus, sent from Rome by Pope Honorius I, preached to Cynegils, King of Wessex. To the north, enclosed between the River Thames and its tributary the River Thame, lies Dorchester, a small village with a great Abbey, a cradle of English Christianity. The building we now see was begun in the 12th century, replacing two earlier Saxon cathedrals (some Saxon fabric is still evident in the north wall of the nave). The Norman building expanded in the 13th century and was richly aggrandised in the early 14th century when the chancel was added with its wonderful window sculpted with the Tree of Jesse, its stained glass and its exquisite sedilia. The great tower, rebuilt in 1602, but incorporating a 14th century spiral staircase, rises above a lush landscape of willows and flowering water meadows. On this site, perhaps in the Thame itself, Birinus baptised King Cynegils, with Oswald King of Northumbria standing godfather. King Cynegils and King Oswald granted Birinus some land in Dorchester to build a cathedral church whose sphere of influence extended from the south coast as far north as modern-day Bedford and Towcester. This small cathedral was built of wood, most likely on the site of the existing Abbey, and Birinus was buried there in 650. But then came the threat of war between Wessex and Mercia, so the Bishop’s seat and St Birinus’ relics were moved south to the relative safety of Winchester. The diocese was divided into two ca 680, with Mercia gaining control of the northern part and transferring the bishopric to Lindsey and Leicester. This lasted until the Danish raids of the 870s: Lindsey was abandoned and Leicester was unsafe, and the bishopric was transferred back to Dorchester. 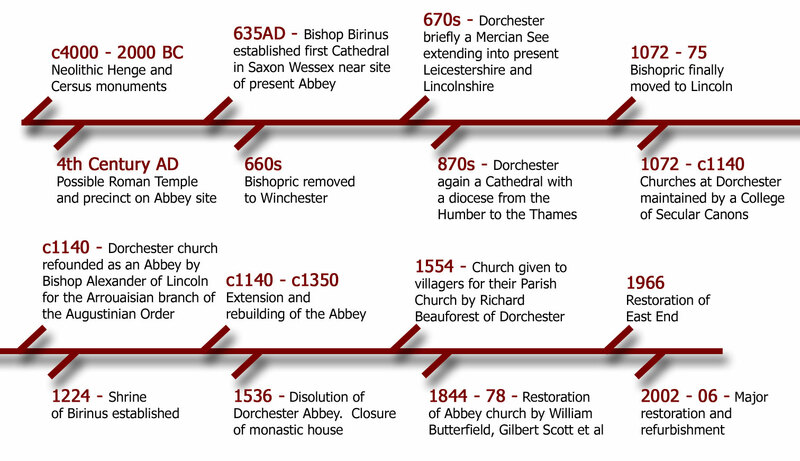 Thus, at that time, the diocese of Dorchester, under the Saxon Bishop Wulfwig, extended from the Thames to the Humber. However, Dorchester did not have any secular importance, and Oxford and Wallingford became the two main administrative and military centres of the region. The first Norman bishop was Remigius, installed in 1070, and parts of the church he built are incorporated in the Abbey’s fabric. However, the Domesday book makes it clear that by 1086 the bishopric had been moved to Lincoln, so the building presumably served simply as parish church until 1140 when Bishop Alexander refounded it as an Abbey of Augustinian canons. The 12th century Abbey was of cruciform plan, with a long, simple nave without aisles, the nave possibly continuing to serve as the parish church. In 1225 the tomb of St Birinus, incorporating some supposed Birinus relics, was opened to the public, and the Abbey became an important place of pilgrimage. As a result, during the next 100 years funds became available for the addition of the north and south choir aisles, the tower, and a new shrine for St Birinus’ relics. The wonderful eastward extension of the sanctuary with its sculpture, tracery, stained glass and the unique Jesse window, were added in 1340, as was the People’s Chapel. Then, in 1536, during the reign of Henry VIII, the Abbey was dissolved and St Birinus’ shrine destroyed. The Abbey escaped the most destructive effects of the Dissolution of the Monasteries because Sir Richard Bewfforeste, ‘a great riche man’ of Dorchester, paid Henry VIII the value of the lead on the chancel roof (£140), and thus saved the church for the parish. The other monastic buildings disappeared, except for the Guest House to the west of the Abbey. The tower was rebuilt in 1602, and there were major repairs in the mid-18th century. A hundred years later, following an appeal led by the Oxford Architectural Society, two famous architects, Butterfield and Scott, undertook major restoration work on the chancel and the roofs. Further urgent repairs were made possible in the 1960s (through generous support from the American Friends of Dorchester Abbey) and 1970s (following a national appeal), and then in 1998 a major refurbishment programme was started and is still ongoing. The object was to put the building into good repair, make it warm and welcoming, and suited to a wide variety of uses, both religious and secular. Today it is still the spiritual centre of the village, a wonderful venue for concerts and other events, and a great place for a day out.